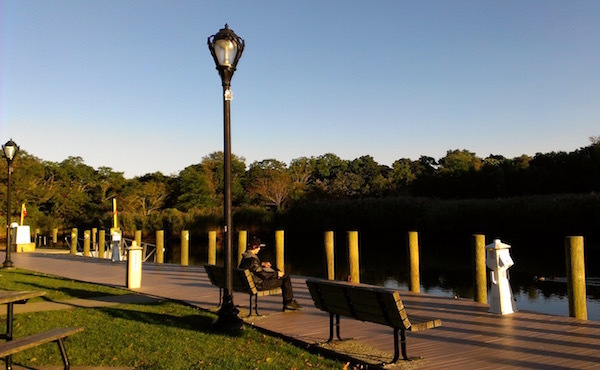 The Peconic Estuary Program is planning a rain garden in downtown Riverhead. The Peconic Estuary Program, in partnership with the Town of Riverhead, is celebrating Earth Day 2016 by planting a rain garden in downtown Riverhead on Saturday, April 23 at 10 a.m. The rain garden will be located on Heidi Behr Way in the back parking area behind the Main Street shops, along the bank of the Peconic River. The Peconic Estuary Program is looking for volunteers to spend a few hours helping to plant the rain garden on Earth Day. PEP is also hosting a native plant garden workshop at the Big Duck on Flanders Road in Flanders on Wednesday, April 13 at 4 p.m. PEP will teach attendees about the benefits of native plantings, rain gardens and rain barrels at the PEP native plant garden at the Big Duck. You’ll also have a chance to help mulch, weed and collect water from the rain barrel and get tips on how to make your yard more eco-friendly. Bring gardening gloves and tools if you have them. Rain gardens provide habitat for wildlife and pollinators and reduce the amount of runoff from parking lots, rooftops, and streets into the Peconic Bays and the Peconic River. The downtown Riverhead garden will also act as a barrier to trash, oil and gasoline, bacteria, and other chemicals from the parking lot that rainwater would otherwise wash into the Peconic River. Rainwater will be filtered through sand, gravel, and root systems within this gardens, reducing the chance of pollutants entering the waterways and groundwater supply. The Peconic Estuary Program is also continuing its Homeowner Rewards Program, which provides funding for planting your own rain garden. More information is online here. For more information on the PEP Riverhead Rain garden, the Homeowner Rewards Program, or other educational programming, contact Sherryll Jones, PEP Education and Outreach Coordinator at [email protected] or 631.727.7850 Ext. 353.